Join us on a trip of a lifetime in the Majestic Sea of Cortez, along the mountainous Baja coast line. 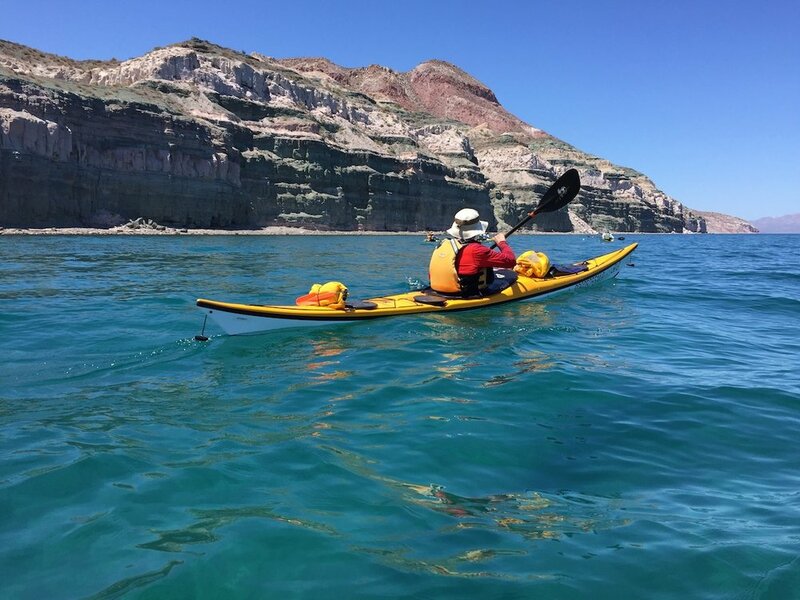 This sea kayak trip will also circle one of the most beautiful islands making stops at stunning isolated beaches with aqua blue waters, towering multicolour cliffs, natural stone arches and numerous sea caves. An amazing lay-over day at a very special place called fossil beach makes for an exciting day of discovery. Millions of years ago ancient sea beds heaved upwards exposing numerous shells and bones. Recently a new species of dolphin was discovered when a paddler found the head embedded in rock along the beach where we camp. On our last trip two shark teeth were found by Jay (Earth Travellers guide) on top of a cliff at least 100 feet above the ocean. You will spend moments watching the manta rays leaping out of the water or paddle beside sea lions and glimpse dolphins at play. There are cruising whales, loads of tropical fish and numerous species of seabirds that are all apart of this bucket list trip. Spend 13 days on the water with a BCU level 4 kayak guide and marine biologist as well as one of the Earth Traveller’s friendly tour leaders. This is your chance to enjoy the Earth's aquarium from the seat of your kayak. Converted from CAD based on the latest exchange rate. Final amount and payment will be in CAD. Final conversion rate is determined by your bank. Welcome to the first day of your sea kayak trip of a life time! Arrive to Baja Mexico via La Paz airport. Collect your baggage and now is a good time to exchange some money into Pesos. This will come in handy for tipping at the end of the trip and it’s good to have a little local currency on hand around town. Our shuttle will be waiting to take us to our hotel down town. Check in and check out the town if time permits. Once settled in, the whole gang will go out for dinner (not included in trip cost). We will arrange a time to all debrief and go over the kayak trip plans and meet our Mexican kayak guide and marine biologist. Then settle in for a good night’s rest and dream of what lies ahead. Wake up to the sounds of the ocean and the smell of fresh coffee. Enjoy breakfast and pack the kayaks for our long crossing heading slightly north then east towards San Francisco Island. On route if the weather remains calm we will veer-off toward a small island full of sea lions. Get those cameras ready! After we will land on a nice sand beach surrounded by aqua blue waters for our lunch stop. With our bellies full another smaller crossing towards the southern tip of the most beautiful and seldom travelled island in the Sea of Cortez, San Jose. Lucky you for picking this tour. While most tour operators are bumping into each other on their well travelled routes to the south and north, we will have the entire island to ourselves. YAY! Our paddling continues to the east and around the tip then to the north for a short distance, where we will be landing at the base of giant rock cliffs that resemble a massive stone-head. Wow! It’s a smooth rocky landing and then we haul the kayaks up to a safer spot. Welcome to camp. While the guides prepare dinner feel free to explore the beach and walk up the steeper path to the top of the hill. Bring your camera for an expressive bird’s eye view of the eastern coast and our route to be paddled to the north. After an amazing breakfast we will paddle north to a place called fossil beach. Notice the change in the rock formations as we cruise up the coast. Keep an eye out for whales, dolphins and leaping manta rays. Below you is a diverse aquarium of tropical fish and when the water is calm and you have your sunglasses on, you can catch the mesmerizing display. Not a lot of easy spots to land here but we will find a cozy little nook to tuck into for lunch. The variety of classic fresh Mexican food will empress you, trust me! Our guides know how to prepare some tasty eats and you don’t get this kind of view sitting at home on your couch. Off to fossil beach. This will become a place that you will remember forever. Sculpted sandstone cliffs, sand beach and a canyon to hike and explore are just some of the many highlights in this area. Oh yeah, did I mention millions of year old bone fossils in the rocks along the ocean! The first time I explored this area I didn’t want to leave. A new species of dolphin was discovered here and I was lucky enough to find ancient shark teeth 80’ up the side of a cliff that used to be under water millions of years ago. Set up camp and get cozy because we are going to stay here a full extra day to really take it all in. Excellent swimming, snorkelling and cliff jumping as well as fossil viewing and back canyon exploring. Time to discover! Another day at Fossil Beach to do whatever you didn't get a chance to do the day before. Trust me, you'll be glad to have this extra time! Now that we are all charged up and our stomachs full from breakfast it’s time to say goodbye to fossil beach. A place to brag to all your friends and family in the future. As soon as we start paddling north we will pass the most beautiful cathedral, wind and water sculpted sandstone cliff. It will take your breath away! We have named it “sandstone amphitheatre” for good reason. We know you won’t want to leave this bay but we must keep paddling a little further north to one of the best snorkelling places on the island. A short break here allows people to swim in the Earth’s aquarium amongst an array of tropical fish. For those not wishing to swim we recommend paddling very slow close to shore and you will be able to see the fish swimming right under your kayak with amazing clarity. Lunch will be a little further alone the coast and then we will paddle to Quatro Palmeras beach to make camp. Just before we get to the camp spot we will paddle past a very small ranch village. These rancheros live a tough life isolated away from the main land in this valley. Back on Quatro Palmeras beach you will notice that the towering white cliffs make an amazing back drop and unique settling to explore. These white cliffs have been heaved straight vertical hundreds and hundreds of feet up. In these ancient sea bed cliffs are millions of fossilized sea shells. Some shells over 12” in diameter. Take lots of pictures to remember this special spot. Enjoy breakfast below the towering white cliffs. Today we will be hiking with a guide across the centre of San Jose Island. This interpretive hike takes is some beautiful views and we give you better understanding of the ecosystems that make up the Baja area. Watch for wild goats, snakes, lizards, birds of prey, and other dessert critters along the way. Enjoy lunch on our hike. After the hike we will return to the beach and relax, explore, or take a swim. Once dinner rolls around we will walk down the beach and into the little community to enjoy a special traditional meal from one of the rancheros families that call San Jose Island their home. A generous tip here will truly help these amazing people. What a great day full of adventure, discovery and culture! Back to the kayaks to paddle north to the land of arches and sea caves. Sounds exciting doesn’t it? Enjoy breakfast and then pack the kayaks and let’s go paddle amongst the numerous massive stones arches and sea caves on route to the most northern tip of San Jose called Punta Calabozo. Here the water is aqua blue and it will make a great place to have lunch. To the north you can view Isla San Diego and in the distance the bigger island is called Isla Santa Cruz. Keep an eye out for sea lions, and whales cruising by to the east and west in the deeper channels. As we start to round the point after lunch we will be passing some impressive caves that you can paddle in and through. Be careful here not to hit the rocks with the kayaks because it can get pretty tight in some of the caves. What an unbelievable place to paddle and explore. Still no other paddlers around either! Depending on the weather and the wind direction we will pick one of two beaches on the northwest side on San Jose to be our camp spot. Dinner and movie. Just kidding! The sea-scape is your feature film this evening and with a little luck we will catch glimpse of manta rays, whales and dolphins swimming up the channel between the island and the mainland. My first trip here I saw hundreds of dolphins swimming and leaping into the air through this vary spot. After breakfast we will paddle south a few kilometres and then make the crossing back to the mainland if the weather will allow us. If not, then plan “b” will take us south along the west side of San Jose island. Enjoy the glow of the morning sun as it lights up the mountains to the west. Once we reach the mainland we will be stopping at Punta Alta for our lunch. This is the site of a small fishing out post camp. After lunch we will paddle north past Punta el Cerro and then follow the massive cliffs to the east. Camp will be on a black sand beach surrounded by black volcanic cliffs. There is a great valley leading inland between the cliffs that would be worth exploring. Dinner and another night under the beautiful stars. Coffee and breakfast served and repack our kayaks to head south along the coast towards a small point with a large rock at it’s end. When paddling south past Nopolo beach there is an impressive stone arch that can be paddle under at high tide. We will stop in this area to enjoy a shore lunch. The coastline here is full of little bays to explore and lined with beautiful coloured cliffs. Our final stop will be at Large Rock beach point to set up camp and feast on another great meal from our guides. Good morning! Breakfast is served and another day of adventure awaits us. Today we will be paddling south past the small community call San Evaristo. Mainly a fishing village but it also supports a desalinization plant. We will continue a little further south to enjoy our lunch. Our camp spot will be a familiar one as we camped there back on day 1 at night. Arroyo Verde or Green beach will once again be our camp spot on route back to our put in point at Punta Coyote. Day 12 will be an extra full day in and around Arroyo Verde. This extra day will allow for some flexibility in our program in case of unforeseen bad weather or wind days. Day 12 will be a day to relax, practice rolling or get out for a hike. Enjoy and relax. Our last full day of paddling in Baja. Don’t be sad! You can come back next year with us. After breakfast we will be paddling south southwest back to our starting point at Punta Coyote. Here we will enjoy one last night on a sandy beach before being picked up after breakfast in the morning by our shuttle. We should arrive back to La Paz in good time. This is also a great time to pool tip money from the group to the tour leader. We recommend 10% of the total trip cost as a guideline for tipping. I hope you enjoyed your last night on the beach in Baja. After breakfast we will be picked up by our shuttle to take us back into La Paz. Anyone interested in taking a boat tour in La Paz harbour to see Whale Sharks and even swim with them, just let us know. A once in a lifetime opportunity to see these gentle giants. A cool ending to an amazing trip of a lifetime! (not included in the trip price but well worth it!) Check into our hotel to get cleaned-up and a final dinner together as a group for those that are interested. Sleep well in a cozy bed tonight because tomorrow we will have a long day flying back home. If time permits, we can grab some breakfast before departing to the airport. Have a safe flight home and we hope to see you again on another Earth Travellers get-a-way. Fill Out The Form To Email Us! EARTH TRAVELLER ADVENTURES, CONTESTS, NEWS & PROMOS!